Payment may be made at the office, mailed in or paid online. We accept cash, check, money order, or ACH debit from a bank account. We also accept credit cards payments online and in the office using Discover, Visa or Mastercard. Note: Saraland Water will not accept starter or counter checks effective February 7, 2019. Online payments will incur a fee of 3% of the total amount of the transaction. Problems paying online? Click here. 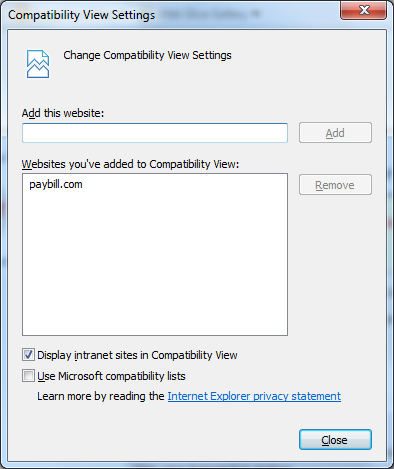 Depending on your IE version you may need to change your Compatibility View Setting. On the bar menu of Internet Explorer, you’ll need to click on Tools, then, Compatibility View Settings. The below screen should then appear. If the paybill.com text is underneath the Add this website field, click the Add button so it appears in the Websites you’ve added to Compatibility View field. Then close your browser and bring up the https://www.paybill.com/saralandwater website again. A $30.00 returned check fee is charged to each customer for payment made via check if the check is returned due to being dishonored by the customer’s financial institution regardless of reason. Returned checks may not be paid for by another check; only by cash or money order. The customer is contacted by phone and given until 1:00 p.m. the next business day to pick up the returned check. If the contact number on file is not a good number a returned check notice (yellow notice) will be hung on the front door and an additional $10.00 fee will be charged to each customer giving the customer until 1:00 p.m. the next business day to pick up the returned check. If the customer does not respond to the returned check notice on the door; the meter will be locked, a second notice (pink notice) will be hung on the front door and an additional $30.00 fee will be charged to each customer. Once the meter is locked, the customer must contact the office staff to inquire whether or not their deposit needs to be updated. If the deposit is current the customer must come into the office and pay the returned check fee in addition to all applicable fees. If the customer needs to update their deposit the customer must come into the office show proof of ownership or lease agreement along with valid photo identification and pay for the returned check in addition to all applicable fees and deposit update. ACH is an automatic debit from a bank account that happens on the 10th of each month. There is a $1.50 fee for this service each month. ACH must be set up at our office. Click here for sample form. A $30.00 returned ACH draft fee is charged to each customer for payment made via ACH draft if the ACH draft is dishonored by the customer’s financial institution regardless of reason. Returned ACH draft may not be paid for by check; only by cash or money order. The customer is contacted by phone and given until 1:00 p.m. the next business day to pay for the returned ACH draft. If the contact number on file is not a good number a returned ACH draft notice (yellow notice) will be hung on the front door (and an additional $10.00 fee will be charged to each customer) giving the customer until 1:00 p.m. the next business day to pay for the returned ACH draft. If the customer does not respond to the returned ACH draft notice on the door; the meter will be locked, a second notice (pink notice) will be hung on the front door and an additional $30.00 fee will be charged to each customer. Once the meter is locked, the customer must contact the office staff to inquire whether or not their deposit needs to be updated. If the deposit is current; the customer must come into the office and pay the returned ACH draft in addition to all applicable fees. If the customer needs to update their deposit; the customer must come into the office, show proof of ownership or lease agreement along with valid photo identification, and pay for the returned ACH draft in addition to all applicable fees and deposit update. If a check is returned “Account Closed” a $30.00 returned check fee is charged to each customer for payment made via check if the check is returned due to being dishonored by the customer’s financial institution. Returned checks may not be paid for by another check; only by cash or money order. The customer is contacted by phone and given until 1:00 p.m. the next business day to pick up the returned check. If the customer does not pick up the “Account Closed” returned check; the account will be immediately locked and an additional $30.00 fee will be charged to the customer along with the returned check fee. Once the meter is locked; the customer must come into the office show proof of ownership or lease agreement along with valid photo identification and pay for the returned check in addition to all applicable fees and deposit update (if needed). If the deposit for a new account is paid with a check and the check is returned due to being dishonored by the customer’s financial institution regardless of reason the customer is contacted by phone and given until 1:00 p.m. the next business day to pick up the returned check. If the customer cannot be reached by phone or does not come in by 1:00 p.m. the next business day the meter will be locked and an additional $30.00 fee will be charged to each customer along with the returned check fee. The meter will remain locked until payment of the returned check and all applicable fees are paid in full. Once a customer has submitted three (3) returned checks / ACH drafts for payment their account will be given a twelve (12) month period of time in which they cannot present a check / ACH draft as payment. A collectible account is any account with a delinquent balance due in water by the 20th of a month. On the 21st of each month all collectible accounts are put on a collection list and given to the collector. The collector then attempts to collect funds for unpaid balances. Every customer on the collection list is given the opportunity to pay the collector when the collector comes to the front door of a residence or business where the water service is located. Every customer on the collection list has the opportunity to pay the water bill before it becomes delinquent. The customer can pay the delinquent water bill without collection fees, as long as payment is received in the office before the collector reaches their residence / business. The morning of the 21st of each month the collector begins the collection process. Every account has the opportunity to pay the collector at the front door of the residence or business where the water service is located. The collector will ask for the delinquent amount due of the water bill plus a $10.00 collection fee per collection attempt. If the account is eligible and the customer can not pay the collector at the door or if the customer is not home; that account is given a blue notice. The collector will hang a blue doorknocker on the doorknob/handle of the front door of the residence / business where the water service is located. The blue notice gives the customer 24 hours to pay the past due water bill without interruption in water service; at a cost of the delinquent amount due on the bill plus a $25.00 blue notice fee. Once an account has received three collections, that account is no longer eligible for blue notices and becomes a Money Or Meter (MOM) account. Once a blue notice is given; the customer has 24 hours to pay the delinquent water bill plus collection fee without interruption in water service. However, if the customer does not pay within the 24 hour time period, the collector goes back to the residence or business to make a second attempt to collect the balance due. If the resident or business representative pays the collector on his second attempt the amount due is the past due bill plus $35.00 in fees. If no one pays the account on the second attempt, the collector will lock the meter with a lock or locking device. The balance due then becomes the delinquent bill plus $55.00 collection / unlock fees. At the time payment is made, the office clerk will verify the deposit posted on the account. If the account does not have the current deposit for homeowner / renter / business; the customer will be asked to show proof of ownership or a rental agreement and asked to update to the current deposit amount, before the lock or locking device is removed. Every account has the opportunity to pay the collector at the front door of the residence or business where the water service is located. If someone is not at the residence or business of a MOM account to pay the water bill; the collector will lock the meter with a lock or locking device. The collector will hang a pink doorknocker on the doorknob/handle of the front door of the residence / business where the water service is located. 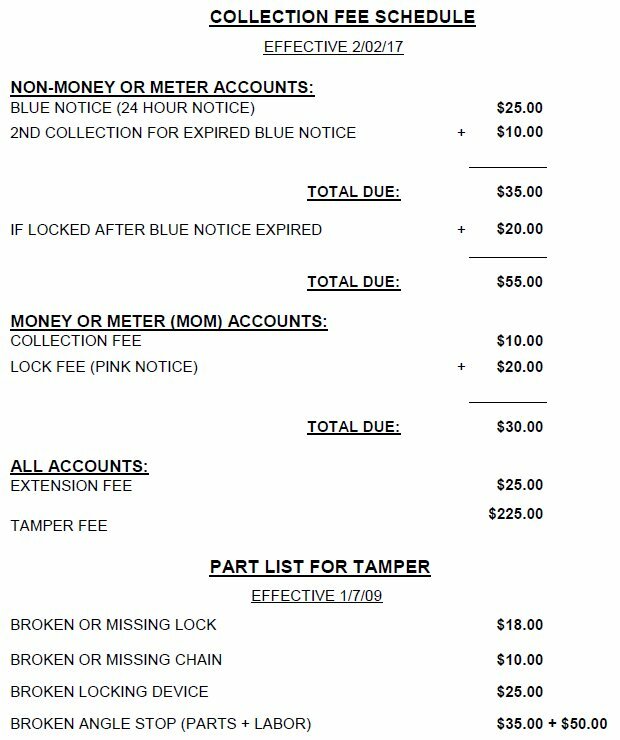 The amount due to have the meter unlocked will be the delinquent amount due on the bill plus a $30.00 collection / unlock fee. At the time payment is made, the office clerk will verify the deposit posted on the account. If the account does not have the current deposit for homeowner / renter / business; the customer will be asked to show proof of ownership or a rental agreement and asked to update to the current deposit amount, before the lock or locking device is removed. If a MOM account pays their water bills for 12 consecutive months (1 year) without any collection attempts that account will no longer be a MOM account. That account will revert back to Blue Notice procedures again. In the event a customer tampers with a locked meter, but does not damage or break the meter, angle stop, lock, or locking device; the customer will be required to pay the current tamper fee along with the delinquent water bill and collection fees. If the customer tampers with a locked meter and damages the meter, angle stop, lock or locking devices; the customer will be required to pay the current tamper fee amount, delinquent water bill, collection fees, as well as, pay for broken / damaged equipment. Current fees for tampering and broken / damaged parts are posted in the office. Before collection begins the account holder may request an extension (pay the bill later in the same month). The account must pay the amount due of the water bill plus $25.00 extension fee on the date agreed upon by both the account holder and the office supervisor or office manager. Extensions are reserved for hardships, emergencies and extenuating circumstances. The privacy act limits the amount of information that can be given to someone other than the account holder. Locked accounts and extensions can only be discussed with the account holder. We can discuss an account if the account holder has given POA or has given written permission to Saraland Water Service to discuss the account with a specified representative.